A strong and effective online presence is something that has become a compulsion for each and every online business owner. A company or a business looking for success needs to have an informative and interactive website. This is essential for each and every business organisation willing to have a very strong brand presentation along with the presentation of its products and services. This is also considered one of the most efficient methods of reaching customers and clients throughout the world. Apart from possessing an effective and strong website, business owners should also make it a point that their websites are manageable and easy. Several factors and good planning go into developing a website and these include presentation, content and designing. Magento is considered one of the most important eCommerce platforms possessing the capability of delivering exceptional level of customization security, possibility and stability. A large number of developers throughout the world make the effective use of Magento development system for creating online shopping portals or websites. Magento is considered one of the most reliable and efficient eCommerce platforms because it provides customized solutions for online stores. It has been evaluated through current trends and survey results that these days, a large number of business owners are going for this feature-rich platform because of its large set of greater administrative control, flexibility and matchless functionalities. It is a professional and feature-rich open source eCommerce solution offering businesses complete control and flexibility over appearance, content and functionality of their eStores. The highly insightful administration interface of Magento containing powerful content management and marketing tools gives sellers complete power of creating personalised websites as per their exclusive business requirements. Backed by extensive support network and fully scalable, it offers businesses one of the most important eCommerce solutions. There are limitless possibilities offered by this platform. If you are looking to offer a customer-friendly website for your clients then it is necessary for you to make the choice of a company that offers Magento development service. The main benefit of this service is that it allows users to use features like currency conversion, account creation, different language conversions and customized forms without going through any hassle. The running cost for the Magento eCommerce solution is quite low. Users who are looking forward to set up an online business on this podium just need to pay for custom theme development, hosting registration and some extension cost. One of the major benefits of Magento is that it is an SEO friendly podium and therefore it is quite successful in attracting the attention of different web developers. 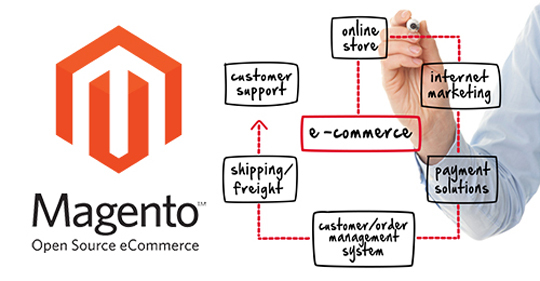 Magento helps its users in developing a user-friendly eCommerce platform. This gives complete flexibility to the business owners in easily modifying their websites even if they do not possess good technical knowledge. This platform allows its users to add new services, products and images in their catalog and adjust a number of payment gateways in an efficient and effective manner. All the points that have been mentioned above will help you in clearing all your doubts regarding Magento development. These points will also help you in understanding the fact that Magento serves as the correct option for your online business.